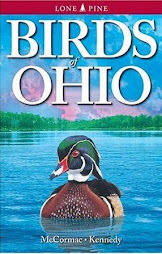 Ohio Birds and Biodiversity: Sea duck invasion: Why? The view from Deer Creek last Sunday morning; air temperature a frosty 14 degrees. That's the Deer Creek dam in the backdrop, which impounds a large reservoir in south-central Ohio. 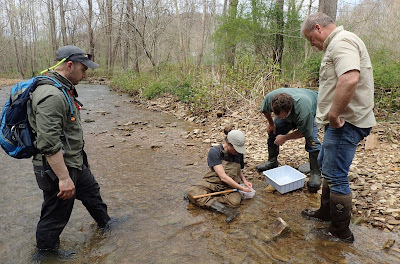 We've had a brutally cold winter, and there are very few streams or lakes with open water. Moving upstream a bit, we come to the tail waters of the dam. Turbulent water flushed through the dam's portals keeps open a stretch of water, and that attracts ducks. Some of the best birding of late has come from streams immediately downstream of dams, including this one. I arrived on the scene to find about 50 fowl loafing just below the dam. A smattering of Mallards, a male Canvasback, a group of Red-breasted Mergansers, and these boys. Two Redheads mix with a species that should perk the ears of central Ohio birders, the Greater Scaup. Normally, even in midwinter, it is the much less hardy Lesser Scaup that is the default scaup, but this winter we've had plenty of Greaters appearing at spots such as this. In fact, there were about twenty scaup at this spot during my visit, and all of them were Greater Scaup. Even though Lesser and Greater Scaup look very similar and can be confusing to separate, the two species are apples to oranges. 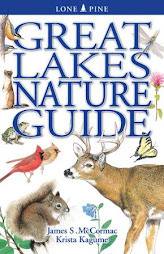 Greaters are far hardier, and are normally rare to casual at best away from the open waters of Lake Erie. Lesser Scaup winter commonly to the Gulf Coast and beyond - I have this species on my Guatemala list. While Greater Scaup are not technically "sea ducks", they are the closest thing to them in the genus Aythya. Most Greaters winter in salt water along the coasts, although a fair number ride out winter on the Great Lakes. Bruce Satta took this gorgeous image of a Long-tailed Duck (Oldsquaw) on the tailwaters below the Deer Creek dam several days prior to my visit. I was really hoping it, or another, would be there but no such luck. 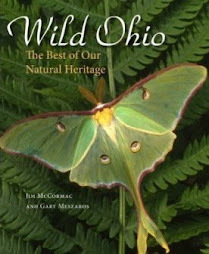 But as the (former) Oldsquaw is central to this story, I wanted to use a photo of one of the central Ohio birds, and Bruce was kind enough to allow the use of his image. 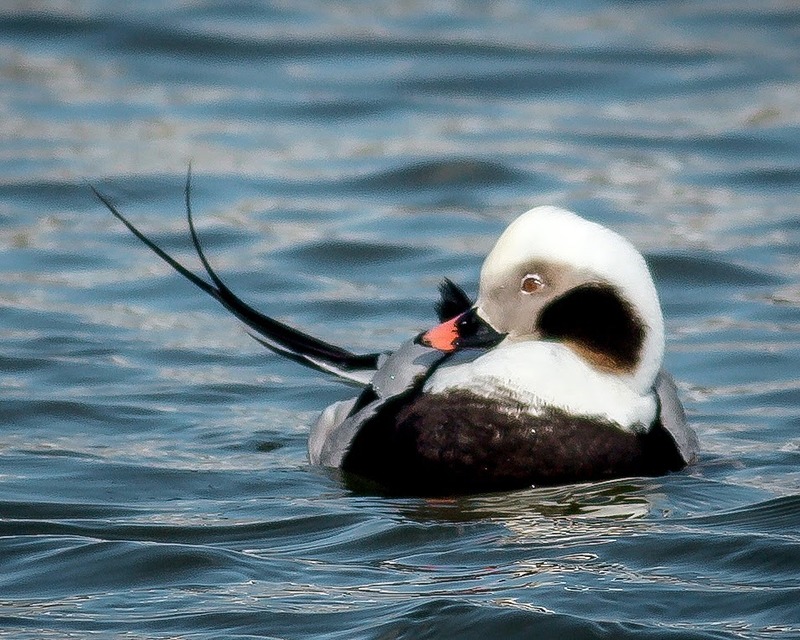 Long-tailed Ducks have also been turning up in large (for Ohio) numbers away from Lake Erie. Like the Greater Scaup, this sea duck is most often seen on our Great Lake, and sightings inland are few and far between. 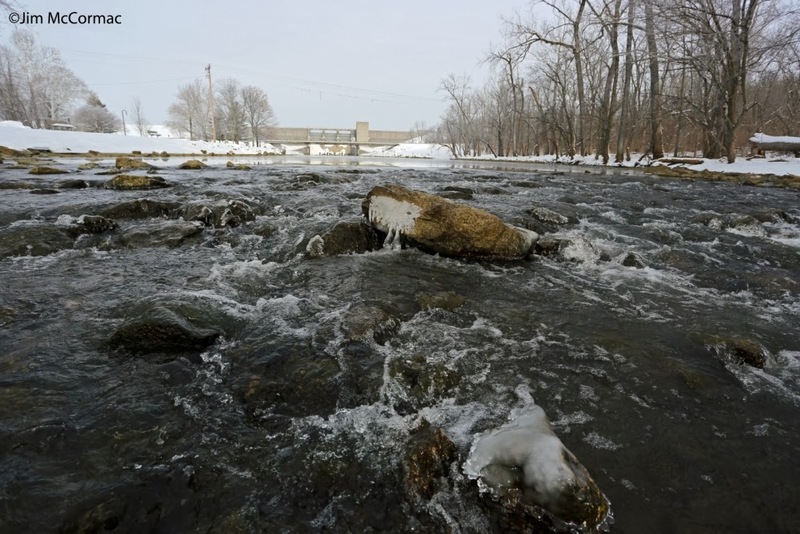 This winter, it seems that any area with open water might produce one or a few. These Arctic-nesting ducks are extraordinary divers, and are capable of propelling themselves to depths of 200 feet or more. Mussels are a favored prey. In tandem with all of the inland Long-tailed Duck reports have been a raft of White-winged Scoter sightings. This astonishing shot was made by Kirk Hewitt at Lake Isabella in Hamilton County. The bird struggles with a massive fish (it recalls THIS POST), but like the Long-tailed Duck, mussels are the preferred foodstuff of White-winged Scoters. An interesting facet of the recent scoter invasion is that all, or nearly all reports are of White-winged Scoters. Not Black or Surf scoters. Why might that be? One important difference between the three species involves feeding habits. Blacks and Surfs are relative shallow divers, typically foraging in waters less than 30 feet deep. White-winged Scoters tend to dive to much deeper depths, often feeding on submerged mussel beds in waters 65 feet deep, and deeper. Thus, the white-wingeds can hang out in deeper waters than their scoter brethren, and often do. Long-tailed Ducks and White-winged Scoters have invaded inland areas throughout the eastern U.S., not just Ohio. To get a feel for the extent of this sea duck incursion, CHECK OUT eBird. 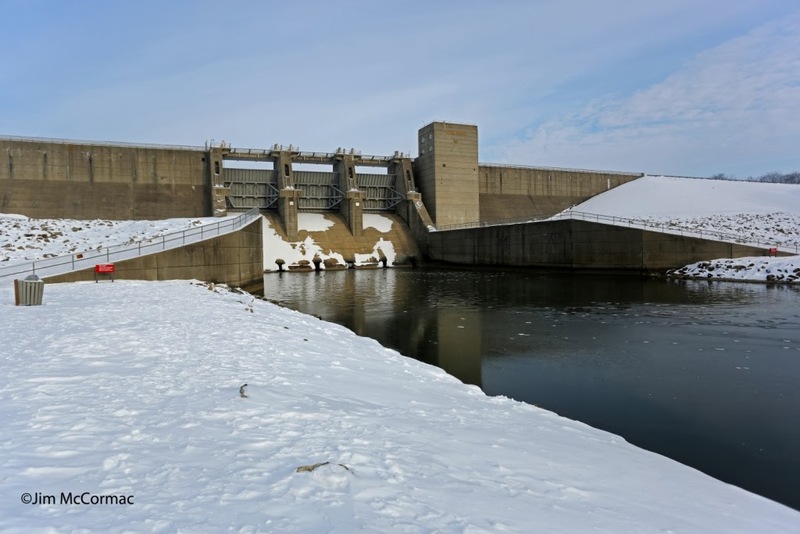 Because of the extraordinarily cold winter, most all of our water is frozen. This is the view of Deer Creek Reservoir, taken from the top of the dam. Nary a trace of open water. The same can be said of nearly all of our lakes, including the great Lake Erie. That's why the few places with open water, such as dam tail waters and parts of big rivers such as the Great Miami and Scioto are often packed with ducks. Even in a cold winter in which Lake Erie appears to have frozen solid, it really hasn't. I took this shot in February 2010, miles offshore from Cleveland, during a waterbird survey flight. From the shore, it would seem that the lake was a giant ice cube. However, there are normally lots of open leads, some extensive, and these openings are often packed with waterfowl. I suspect one would find such openings on the other Great Lakes as well, although I haven't had firsthand experience flying over those in the winter. This ice cover map from the Great Lakes Environmental Research Labratory shows the current extent of Great Lakes ice. Excepting lakes Michigan and Ontario, they are frozen nearly solid. Apparently Lake Erie is about 96% frozen. In short, there are probably few if any open leads to support birds, as there would be in a "normal" winter, even one with lots of ice cover. This U.S. EPA map shows the various water depths of Lake Erie. 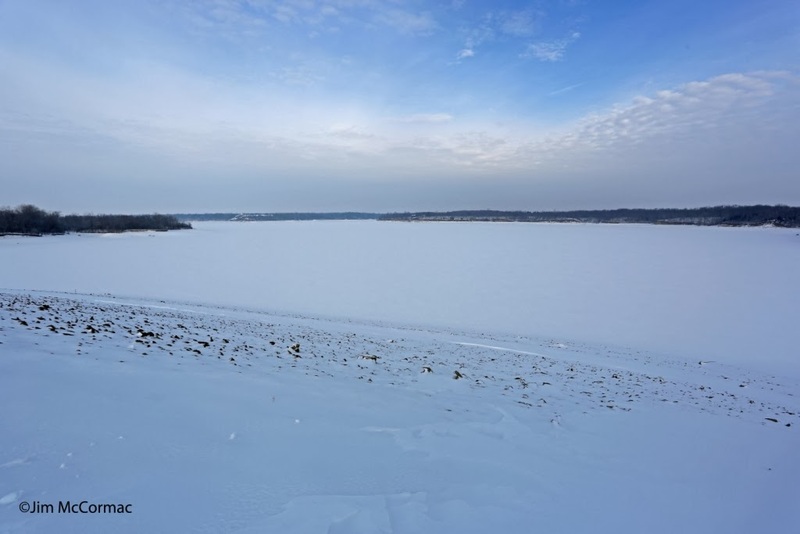 The majority of the lake ranges from 50 to well over 100 feet in depth (the average depth is 62 feet). From my experience, the deeper (blue) portions are those most likely to support open leads in shifting ice, and that's where the birds are in iced-over winters. And there are undoubtedly plenty of beds of tasty nonnative zebra and quagga mussels down on the bottom; a relatively new (first found in 1988) food source that seems to have lured more sea ducks such as scoters and Long-tailed Ducks to spend time, and even overwinter, on Lake Erie. Remember, both the Long-tailed Duck and White-winged Scoter are champion divers, routinely submerging to depths of 60 feet or more to feed. Mussel beds in the deeper portions of the lake would not be off-limits to them, although they might be avoided by lesser divers such as Black and Surf scoters. I wonder if our major inland incursion of Long-tailed Ducks and White-winged Scoters is related to Lake Erie's (and perhaps lakes Huron and Superior) nearly complete covering of ice. If this is the case, it would show how much we have yet to learn about the lake. 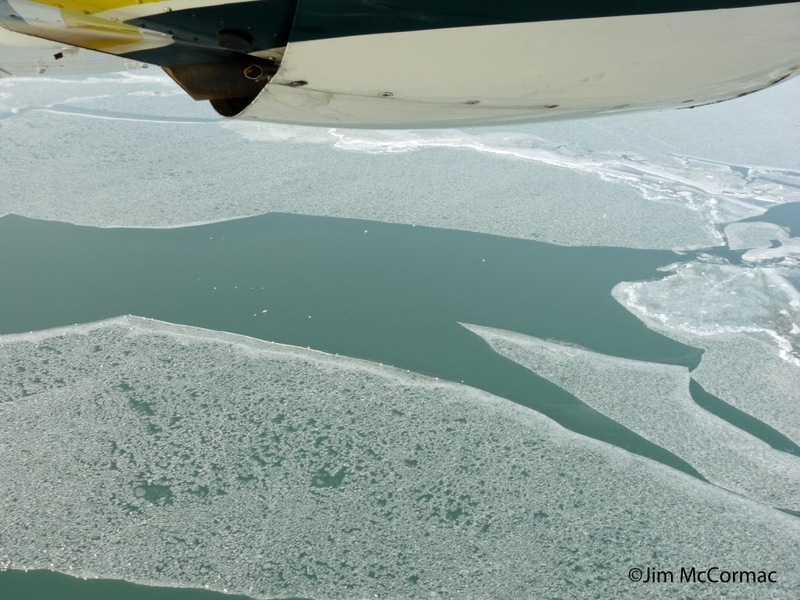 Because of the nearly inaccessible nature of open leads in Lake Erie ice, we know very little about the numbers and species of ducks that may overwinter on them. This brutal and nearly complete freeze may have forced these birds off the lake (and perhaps other Great Lakes) and into more easily observed situations. And given us a window into the numbers of Long-tailed Ducks and White-winged Scoters (and Greater Scaup) that might be wintering out there. Excellent post as usual Jim, thanks for the information and also the insight on what is probably occuring during this exceptionally cold winter! It sure has been a blast this year checking out the open water for ducks since there hasn't been much! !